5 Spectacular Movies Like Star Trek Beyond To Say "Woah"
Are you looking for spectacular movies like Star Trek Beyond? You are in for a treat because I gathered the best list! Science -fiction movies are among my top types, and the good ones don’t disappoint! There is action, adventure, plus really super cool space gadgets that maybe one day we will have. Hello, have you seen what a cell phone can do? I also love when the really good similar films have to throw in a good side of snarky lines here and there. They all have a few fab zingers if you watch closely, haha. Ready to check my picks? I’ve also included the trailer because I wanted to see it again, and thought you might want to sneak a peek! 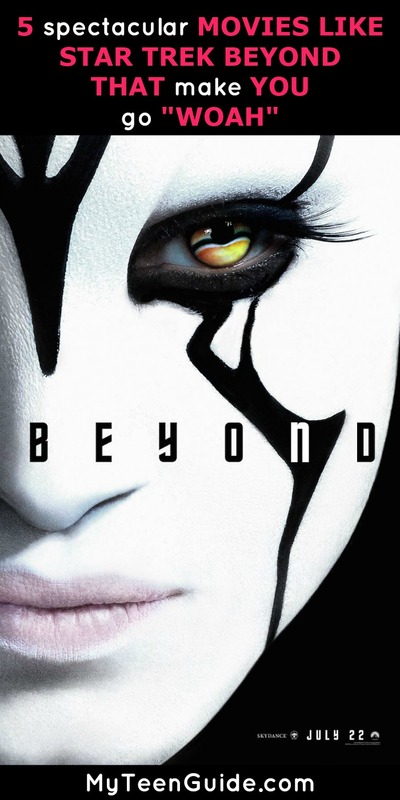 Star Trek Beyond is the 13th film in the Star Trek movie franchise and will be released in theaters on July 22, 2016. If science fiction movies with a bit of action thrown in are your thing, you have to see this film when it hits theaters! Check our Star Trek Movie trivia and quotes for juicy details. Guardians of the Galaxy is a 2014 superhero movie that is based on the Guardians of the Galaxy team by Marvel Comics. It is the 10th movie in the Marvel Cinematic Universe and stars Chris Pratt as Peter Quill/Star-Lord, Zoe Saldana as Gamora, Bradley Cooper as the voice of Rocket Raccoon, Dave Bautista as Drax the Destroyer, Vin Diesel as the voice of Groot and Lee Pace as Ronan the Accuser. The Guardians of the Galaxy team must work together to save the universe from an evil and powerful, Ronan the Accuser. Ender’s Game is a 2013 film that combines science fiction with action and is based on the 1985 book of the same name by author Orson Scott Card. The movie stars Asa Butterfield as Andrew “Ender” Wiggin, Harrison Ford as Colonel Hyrum Graff, Hailee Steinfeld as Petra Arkanian, Viola Davis as Major Gwen Anderson, Abigail Breslin as Valentine Wiggin and Ben Kingsley as Mazer Rackham. Andrew Wiggin is a young child who is unusually gifted. He is sent to battle school, located in outer space, to prepare for an upcoming invasion by aliens. Serenity is a 2005 space-western movie that is a continuation of the TV show, Firefly, which aired on the Fox Network for one season in 2002. The movie stars the same cast from Firefly including Nathan Fillion as Malcolm Reynolds, Gina Torres as Zoe Washburne, Alan Tudyk as Hoban “Wash” Washburne, Morena Baccarin as Inara Serra, Adam Baldwin as Jayne Cobb, Jewel Staite as Kaylee Frye, Sean Maher as Simon Tam, Summer Glau as River Tam and Ron Glass as Shepherd Derrial Book. The movie also introduces an assassin known as The Operative, played by Chiwetel Ejiofor. The crew of the Serenity ship must evade The Operative, who is after one of their own, River Tam, who has telepathic abilities. Starship Troopers is a 1997 satirical movie that combines military science fiction with action and is based on the 1959 book of the same name by author Robert A. Heinlein. The movie star Casper Van Dien as Lieutenant Johnny Rico, Dina Meyer as Private Dizzy Flores, Denise Richards as Captain Carmen Ibanez, Jake Busey as Private Ace Levy, Neil Patrick Harris as Colonel Carl Jenkins and Patrick Muldoon as Lieutenant Zander Barcalow. The movie is set in the futuristic 23rd century, where a futuristic military unit does battle with giant alien bugs called Arachnids. Lost in Space is a 1998 science fiction adventure movie that is adapted from the TV series Lost in Space, which aired from 1965 to 1968. The movie stars William Hurt as Professor John Robinson, Mimi Rogers as Professor Maureen Robinson, Heather Graham as Doctor Judy Robinson, Lacey Chabert as Penny Robinson and Jack Johnson as Will Robinson. The Robinson family takes a journey to a star system but are forced to find their way back home when they are steered off course. Can you think of any other fab sci-fi movies like Star Trek Beyond I should be watching? I always love to hear your recommendations of similar ones down in the comments!